Really interesting post and another gold star for GDS: "The tricky topic of governance." 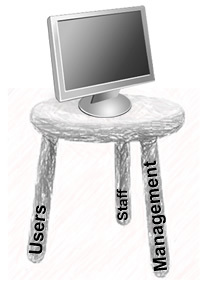 The hard-to-balance 3-legged stool of satisfying users, satisfying staff & satisfying management seems well supported. However, one thing to ponder is what would happen if - in order to satisfy users - you had to dissatisfy staff or management? For example, what if staff had to work long weekends or postpone holidays to get a project done? Or what if you had to ask management to invest far more than planned in order to ensure delivery? The basic question is how far to push things in pursuit of user satisfaction, whilst balancing staff & management concerns? For instance, I have experience of teams that deliver amazing user experience, but from caustic work environments & over-demanding senior management. Read some more thoughts about the 3-legged stool in my article "The new analytics of web governance."